As you may know, Adelaide is a major wine producing city. 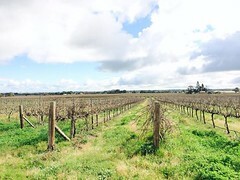 One of the more famous wine producing regions within Adelaide is the Barossa Valley. 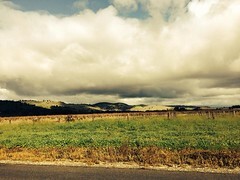 Even if you are not big on wine, the drive to the Barossa Valley is breath taking. 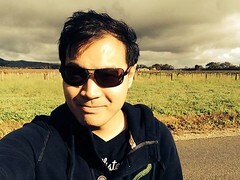 It takes about 1 hour from the city center to Barossa Valley, and along the way you will see a lot of farm fields. Great for taking pictures! We were also lucky as the weather was really nice that weekend. We saw on the news that there was a snow storm the day after we left!! Lucky! I think what I liked most, was that it was so calm and peaceful. Just listening to the wind blow into the fields, sun shining down on you, with blue skies was like heaven on earth. I certainly took this for granted when I was in Toronto. I guess the saying is true, you generally overlook the things you have. I was thinking that we would actually get to tour around the winery itself, but it was actually not available to the public (or maybe you have to book in advance). Instead, we would go to the store section of the winery, where you get taste all the wine and of course purchase any of the wines that you like! !